Is Kanye’s recent Trump-related activity channelling David Hammons and Joseph Beuys? And does that make it any good? Kanye West has returned to Twitter after an 11 month hiatus, grabbing headlines by not just declaring his genius, but also his love for Donald J. Trump. Some have labelled him a troll; others have speculated on his mental health. But one growing conspiracy theory, as seen on Reddit, a Kanye fan forum, and Twitter user @Snowcone965's viral tweet thread, is that he's in the middle of a complex performance art piece. The evidence leans closer to 'tin foil' than 'closed case' at times, but once you get stuck into the web of association and quotations that suggests that Ye is performing, it’s difficult to get out. But is this really all just a performance – and if it is, does that make it any good? The artists David Hammons and Joseph Beuys have featured in Kanye’s recent tweets, with many allusions echoed by friends and collaborators. Hammons subverted racist symbols in his art, and Beuys hugged a coyote as a symbol for embracing America’s inner primordial animal. Is this why Kanye has donned The Donald’s infamous MAGA hat? Perhaps Pepe The Frog is America’s new symbol for humankind’s animal nature? A mood board tweeted by Kanye in late April also contained an ambiguous nod to Andy Kaufman, a comedian who committed to his performances to an uncomfortable degree. ‘Uncomfortable’ might just be the right word for what is happening now. Kanye’s recent posts have a defined set of issues he’s exploring – through platitudes and deeply self-referential images and videos of screens, he’s exploring ego and identity as it is filtered through the media and its ecosystem. But violence and the darkness of history is never far away, always casting a shadow over American life. Kanye’s impact on music has been transformative and trendsetting, but he’s never been satisfied to be seen as just a musician. It’s why he’s so intensely associating himself with individual figures who represent radical societal changes; Steve Jobs and Elon Musk are examples, and – controversially – so is Trump. While he’s endorsed Trumps “dragon energy”, he hasn’t even mentioned the wall, taxes, or the military. And what links African American conservative commentator Candace Owens and shooting-survivor-turned-anti-gun-activist Emma González? Both are unexpected and unlikely figures who’ve disrupted political dialogue in a way that is shaping the future. Some of the recent commentary on Kanye has drawn explicit connections between artist Joseph Beuys’s embrace of the wild coyote and Kanye’s embrace of the MAGA-sphere. 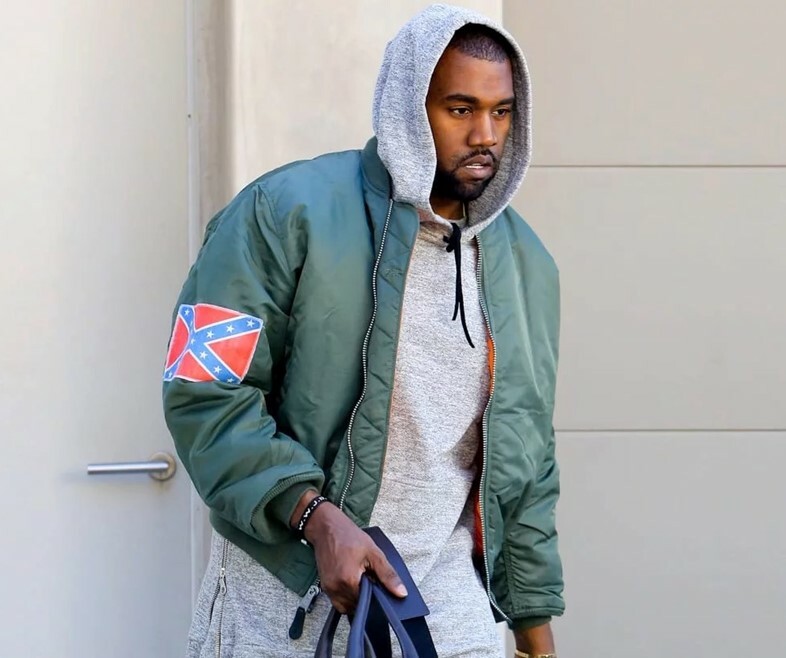 This ignores Kanye’s celebration of figures from many different fields and political affiliations, as well as the Hammons-esque attempts at subversion of a wide range of historically charged symbols beyond Trump, such as that time he wore a Confederate flag in 2013. The rapper’s most distinct contributions to performance art are also what is causing him the most trouble. Hammons explored how meaning existed in language and image, using art as a powerful critique of racism and the clichés of African American life. Kanye’s adoption of the Confederate flag, the MAGA hat, and his controversial claims about slavery, seem closer to ideals of freewheeling consumerism and the myth of the bootstrapping American Dream. Kanye’s unbridled optimism sees creativity as utopian, and he clearly understands history and culture as shaped by the vision of “great” individuals – yet this has led to a flippant detachment from the real world consequences of ideas. Kanye’s statements about slavery (that it was “a choice”) echoed deeply racist, revisionist propaganda. Critics today are increasingly arguing it’s impossible to separate an artist’s work from their activities. Simply put, you don’t get to freely throw ideas out there as art without consideration of the context. There’s a long list of celebrities who have adopted characters and played pretend, flirting with the idea of self-invention and identity in experimental ways – but have these performances ever really been art? Musicians and actors are highly sensitive to the nuances of performance and audience. David Bowie played with the aesthetics of Fascism, and Joaquin Phoenix pretended to give up acting to pursue rap. It was provocative, it was absurd; but it’s not a significant moment within art history. Shia LaBeouf had to stick with his performance art with collaborators Luke Turner and Nastja Säde Rönkkö for a sustained period of time before art critics thought of it as more than a prank. Kanye's return to Twitter, with all the MAGA hats and red pilled republicans, anti-gun activists, and late 20th-century performance art, isn’t a random mashup of references, but a mood board of the cultural, political, and artistic detritus that shapes us today. It may not be a planned performance art project, but there's no doubt it's self-aware, and that these references – as with the dense cultural references that fill his musical back catalogue – are very deliberate. In 2013, Kanye told Charlamagne Tha God on Power 105’s The Breakfast Club, “I’m like Marina Abramović. This is, like, performance art. The thing is, I don’t got a problem with looking stupid.” The likelihood of Kanye's recent statements, and the mass offense they've caused, ending up in a museum or chronicled in the history books is slim; but there is something captivating about how Kanye plays with his identity in the public eye. Only time will tell if he has a plan for how it's all going to end.